These two Art Deco bowls are proving a little tricky to identify. Can anyone help please? The first is a shallow bowl, 32 cms (12.5 inches) in diameter. It's very glossy. 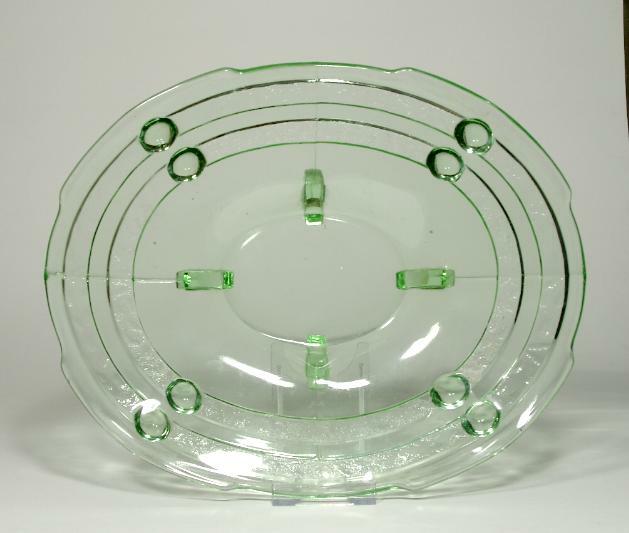 The second is oval shaped with panels of clear glass, frosted glass and very finely patterned glass. It has curved very Art Deco feet. It's 26 cms (10.5 inches) by 21 cms (8.5 inches). It turned up with a Jeanette Glass Cherry Blossom serving plate, and the fine detail is the same quality as the Jeanette, so I wondered if it is also Jeanette? 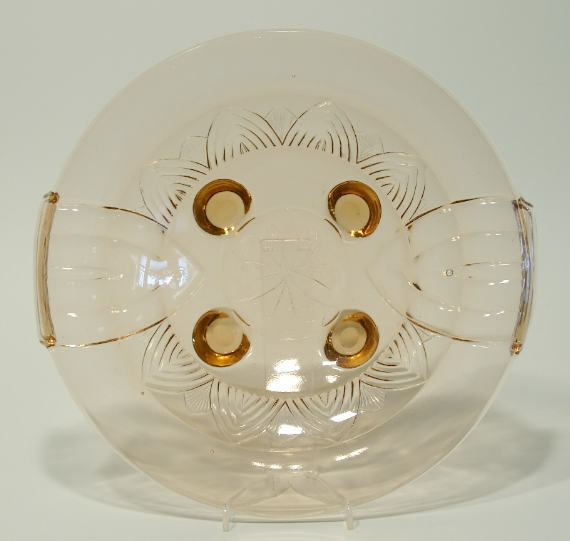 Re: Pink pressed glass bowls - please help with identification! The first one is possibly Walther, according to Pamela ( http://www.pressglas-pavillon.de/schalen/02135.jpg ) and the second she has as 'unknown' ( http://www.pressglas-pavillon.de/schalen/05161.jpg ) and I reckon if Pamela doesn't know no-one does! Many thanks to everyone for your replies. I hoped the first one was Walther when I bought it - it has that feel to it. The second one just turned up in a mixed box. I had checked Pamela's site already, but didn't think to look in her Unknown section. My oval bowl definitely has no Czechoslovakia mark on it anywhere - I've just checked all over. Roz, neither has mine, but all that shows is that either the mould didn't have it on, or it's an older mould which it's worn off. Whichever, I think these bowls are very nice. See http://www.glassmessages.com/index.php/topic,13143.0.html - now updated. Second bowl, C StÃ¶lzle, Hermannshutte, pattern number 19403.